Meet Seattle Center’s own private DJ. Capitol Hill musician James Whetzel has been selecting and mixing music for the International Fountain since 2000. 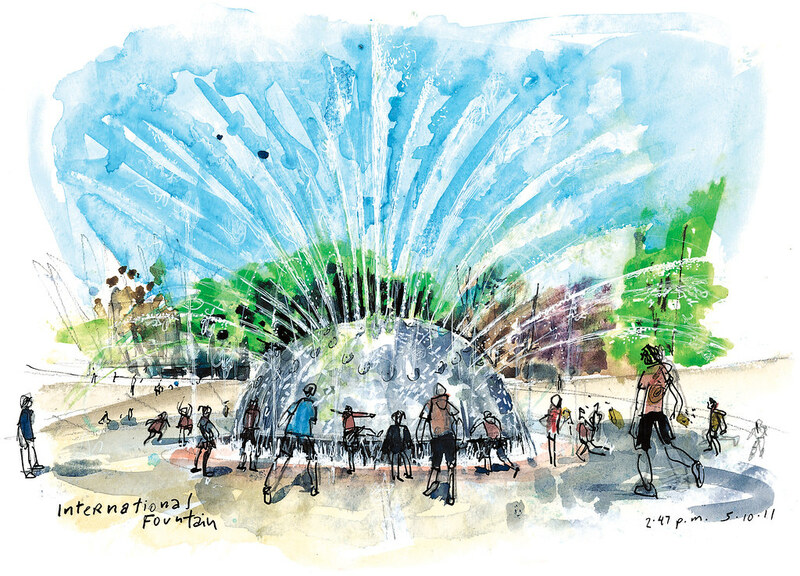 Sketched May 10, 10:55 a.m.
Every week, he hands off a different CD to Bill Droege (below), the Center’s sound chief, who walks through a long underground tunnel to plug it into the sound system located amid giant water pipes about 45 feet below the fountain. Sketched May 10, 11:32 a.m. But that’s the easy part of making the music play. Whetzel, 30, spends hours to create timely mixes that combine good mood, diversity of styles and local artists. In the looping mix this week: Arabic pop reggae by Sabreen; Caribbean steel-drum music by the Toucans, a local band; and cinematic pop by DeVotchKa. “Mambuloo” by Mo’ Horizons, a Latin jazz and funky band from Hanover, Germany. “Chinook” by Loscil, an ambient electronic artist from Vancouver, BC. “Nawari, (The Gypsy) Instrumental” by Sabreen, a Palestinian group from Jerusalem. “Grasshopper (fest. Erik Sumo)” by Easy Life Natural, a Nu Jazz group from Veszprem, Hungary. “Martin Rochford’s/Green Gowned Lass” by Martin Hayes & Dennis Cahill (from the album “Live in Seattle”). “Can’t Help This Feeling (Instrumental)” by The Herbaliser. Whetzel’s music talent goes beyond his responsibilities as Seattle Center’s musicologist. He sings West African and Indian folk music and plays a fretless lute called sarod –that’s why he keeps his fingernails so long, he said. You can learn more about his music on iTunes and SoundCloud. One week every month, I take my sketchbook to a different community following suggestions from readers. Where should I go next? Send me your ideas via e-mail, Facebook or Twitter. Have a great weekend!